A Selection of Stunning Aquamarine Rings! The aquamarine is a very common gemstone that belongs to the group of minerals called the beryl. There are a lot of gemstones that belong to the beryl group including the emerald, heliodor and morganite because of their colour and colouring agents. The aquamarine can vary from light blue, dark blue, blue-green and green-blue in colour. Interestingly, the darker the aquamarine the higher the value. However, almost all aquamarines are of a lighter blue tone, making them much more affordable to purchase. 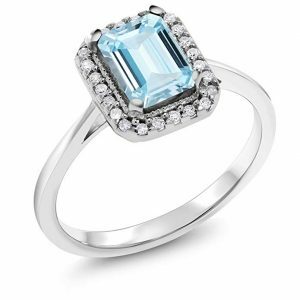 The colour of an aquamarine is also sometimes why it can easily be mistaken for a light blue topaz gemstone. There are many reasons why we love the aquamarine. They have excellent transparency and clarity compared to other gemstones. The gemstone is known for being hard and durable however when banged it can develop cracks internally. An aquamarine is a flawless gemstone which doesn’t have any visible flaws. The cost of producing a synthetic aquamarine is very high so synthetic aquamarine stones are rarely produced because they cost too much. The aquamarine is very popular and is commonly used to create beautiful necklaces, earrings and rings. They are traditionally cut into an oval, round, cushion or pear shape however it is also very common to cut aquamarines into a step-cut and brilliant cut (a rectangle or long shape). Aquamarines are the birthstone for the month of March and range from 7.5 to 8 on the Mohs scale for hardness. When it comes to sourcing aquamarines they can commonly be found in Brazil which is one of the largest producers of the gemstone. The beautiful stone can also be sourced in other places around the world like Kenya, China, Pakistan, Zambia, Mozambique, Namibia and the United States. The beautiful aquamarine is known for its healing powers. Best worn close to an injured or troubled part of your body, the gemstone is known to help and improve the troubled area of your body. It is also thought to help you if you have a sore throat, eye inflammation, varicose veins and even help your arthritis. 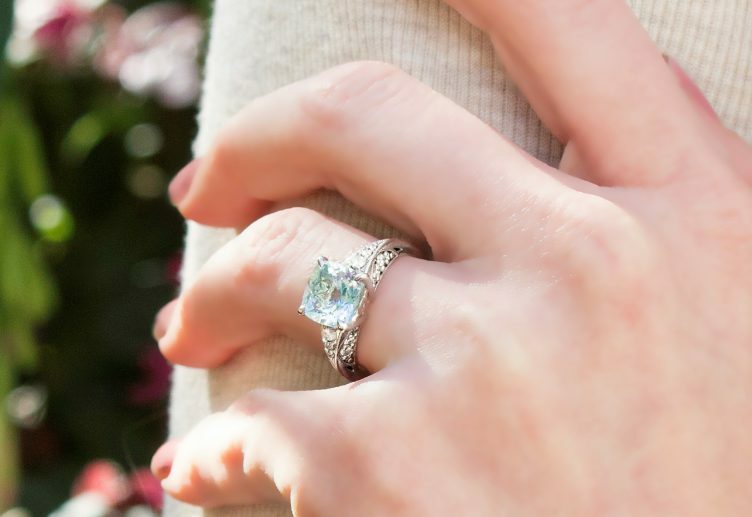 Now we know a bit about the gorgeous aquamarine, we’ve selected ten of our favourite aquamarine rings that are truly stunning! If you want a statement piece that will sparkle on your finger, this is the ring for you! This stunning aquamarine ring consists of a large octagon light blue aquamarine stone as the centre piece. This gorgeous gemstone is then surrounded by individual diamonds that give this ring a lovely sparkle. This cluster of diamonds continues along the ring’s band creating a beautiful display of shimmer that is truly unforgettable. This ring has been made using a solid sterling silver metal that’s composition is extremely tough. 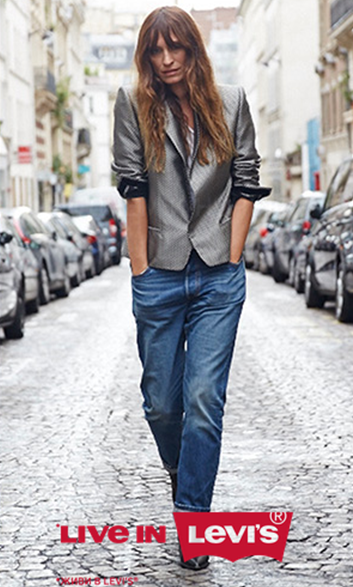 What’s great about this metal is that it has been rigorously texted making it suitable for everyday wear. 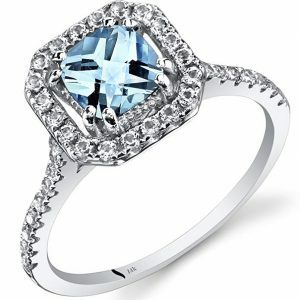 When it comes to the design the ring includes a simulated aquamarine stone which is framed by sparkling cubic zirconia gemstones that are truly stunning. If you like vintage style jewellery then this piece has taken inspiration from the theme but added a modern twist to the design to create this beautiful ring. To give you an idea of the weight of the ring, it is approximately 5 carats and the gemstone has been held securely in place by a 4 prong setting. It’s important to point out that this ring is very large in size, so if you like big jewellery then this will suit you perfectly but if not you may prefer one of our other selected rings. The cut of this ring also makes the light catch it beautifully and looks very elegant. Made by GEM STONE KING, this ring is being sold for a medium price but definitely looks pricier than it is. The jeweller has been making jewellery since 1903 and specialises in gemstones and diamonds. They pride themselves in creating pieces to the highest quality and selling them for a reasonable price. They love variety and looking at their collection you’ll notice they make not only rings but bracelets, earrings, pendants and even engagement rings! Your piece of jewellery will also arrive in a lovely box so. This would make a lovely birthday gift for the lady in your life, particularly someone that celebrates their birthday in March. If you prefer a daintier style ring we’ve found this pretty ring made by the fantastic GEM STONE KING. 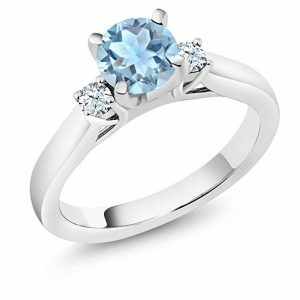 The ring has been designed with an oval blue aquamarine gemstone which has been held in place by a 4 prong setting. 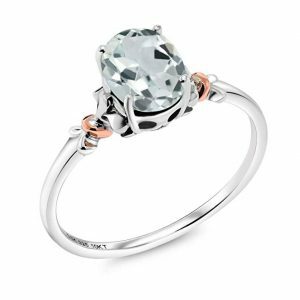 Either side of the gem the ring features rose gold detail that complements the aquamarine beautifully. The ring is completed with a thin single sterling silver band that looks effortlessly simplistic! When it comes to the ring, GEM STONE KING has worked well in creating a classic yet modern piece of jewellery in the form of this ring. Due to its delicate structure we think this ring would be more suited to a person with smaller fingers and in turn this ring would accentuate their fingers beautifully. This is truly a beautiful ring that deserves a place in everyone’s jewellery box. The aquamarine ring has been crafted using a sky blue aquamarine gemstone that has been cut into an oval shape which is approximately 7mm long by 5mm wide. What makes this ring unique is the incorporation of rose gold metal that is featured either side of the centre stone. This immersion of colour works in making the aquamarine stone stand out. The best way to describe this ring would be dainty and beautiful. Once again we’ve opted for a GEM STONE KING ring. 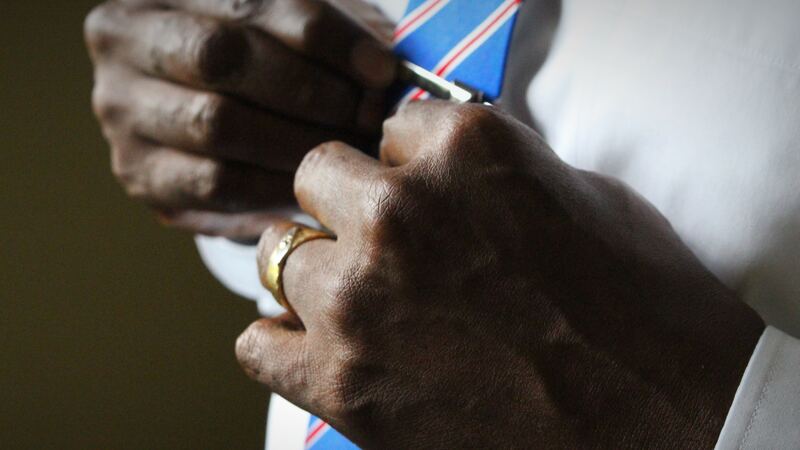 The quality and attention to detail that goes into this ring is quite remarkable. They really are the experts in their field! This particular ring is being sold for a medium price and we think its well worth the dollars. Take a look at their extensive collection, you’ll be spoilt for choice! 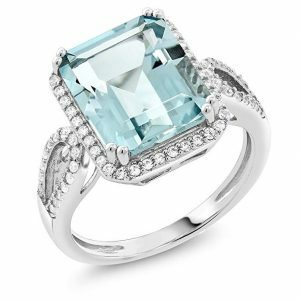 This ring includes a rectangular shaped light blue aquamarine with a triangular shaped diamond either side of the gemstone. These stones are held in place through a simplistic design and positioned on a plain shiny silver band. This aquamarine ring doesn’t include much detail on it but this is what makes it stand out and feel very sophisticated. The ring gives a vibe of understatement class which is a brilliant quality to have. This emerald cut stone has been held in place by a prong setting. The size of the stone is approximately 2mm wide by 0.3inches long. The diamonds either side of the gem are actually white sapphires that have been shaped into a triangle. This piece of jewellery is being sold for a medium price by Jewelili. Browsing their collection they offer a variety of jewellery including necklaces, rings, earrings and bracelets. They love diamonds, sterling silver and yellow gold. Looking at their collection each piece is completely unique and individual so you won’t find someone with the same accessory as you. Their jewellery is also being sold for a very reasonably price which is great to hear. If you’re looking for a gift to surprise someone on their anniversary this piece would be perfect. Take a look and enjoy spending! This is a very unique style ring that you’ll love or hate! 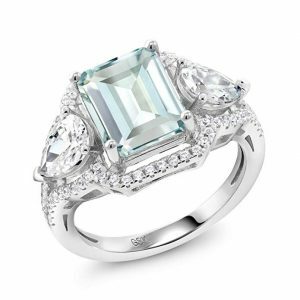 The aquamarine ring has been designed in crisscross style band which holds an oval shaped gemstone in the centre. 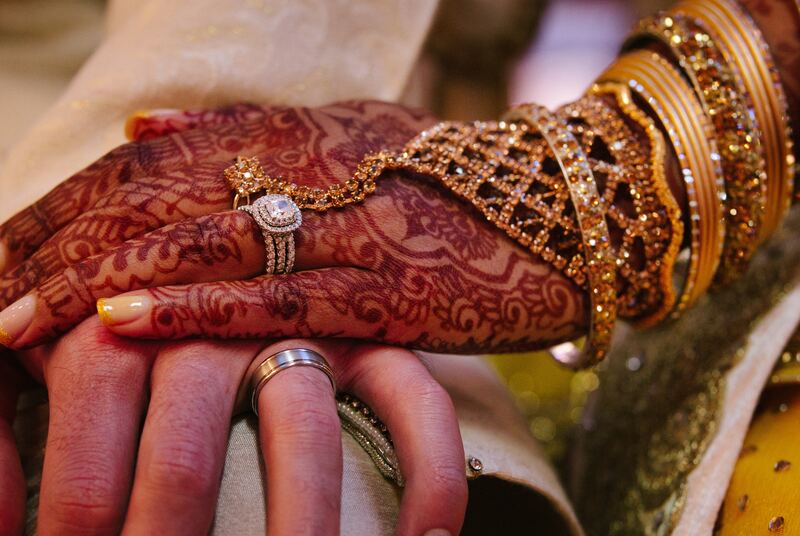 The crisscross band is then covered in a dozen of sparkling diamonds which have been cut into small circular shapes. This is definitely an unforgettable ring! It has been made from solid sterling silver which has an extremely strong composition. The modern design is a lovely piece that you’ll be able to wear on a daily basis at either work or home. This ring would make a lovely birthday present for the lady in your life. It would also make a great gift if you want to treat yourself to something special. 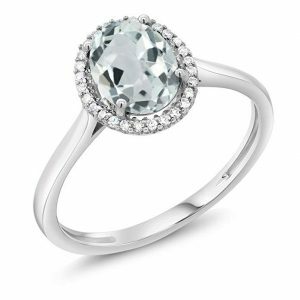 When it comes to the aquamarine, the gem featured is of an oval shape and is a soft sky blue color. The stone has been heat treated and is approximately 8mm in length and 6mm wide. This gorgeous gemstone has been positioned securely in place by a 4 prong setting. The crisscross band also features sparkling diamonds that are cubic zirconia stones. These are white and have been cut into a round shape to approximately 1.5mm in length by 1.5mm wide. The number of stones that are featured along the band are approximately 63. Once again this stunning ring has been made by GEM STONE KING. This jeweller has been making jewellery since 1903 and is the leading jewellers in their field. We love that this ring represents those that are a Scorpio or Gemini. Aquamarines are believed to increase happiness, intelligence and youth. This gorgeous ring is also being sold for a medium price which makes it a great buy! Our next ring is a pricier ring but is a fantastic choice if you’ve got the extra dollars to spend on someone! This pretty ring consists of a halo shaped aquamarine stone in the centre with clear small diamonds framing the gemstone. This halo shaped gemstone is then positioned on a smooth shiny sterling silver band which complements the stones perfectly. This gorgeous piece has been crafted from 10k white gold metal which is extremely strong and suitable to wear every day. The design of the ring which features a halo shaped gemstone in the centre gives off a very classic and sophisticated vibe to it. This sky blue aquamarine has been cut into an oval shape and is approximately 8mm in length by 6mm wide. The blue stone is then fixed securely in place by a 3 prong setting. Small clear white diamonds are also featured within the ring, around the gemstone. These have been cut into a round shape and are 0.05mm long by 0.05mm wide. Even though this is being sold for a high price by GEM STONE KING this is a stunning ring which would make a fantastic engagement ring for the lucky lady in your life. The combination of light blue aquamarine alone side white diamonds look extremely classy. You won’t want to take this ring off for a second! This is another ring made by GEM STONE KING which is being sold for a high price. This stunning ring consists of a square shaped aquamarine positioned in the centre of the ring surrounded by pretty diamonds which have been cut into a circular shape. The stones are then positioned onto a smooth shiny band which looks utterly gorgeous. 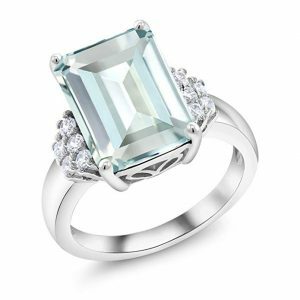 The aquamarine ring has been made from a sky blue coloured stone and 10k white gold metal. The aquamarine has been beautifully cut into an octagon shape and is approximately 7mm long by 5mm wide. This stone has also been securely fixed in place by a prong setting, making it look utterly gorgeous. Framing the aquamarine stone, the diamonds have been cut into a round shape, approximately 1mm long by 1mm wide, equating to 0.17 carats. You may be surprised to hear that this ring actually contains around 25 diamonds in total, that’s a lot of sparkle! It’s one of the reasons why we love this ring so much! We guarantee that this ring will look stunning on your finger. Your lovely ring will also arrive packaged in a cute little gift box. 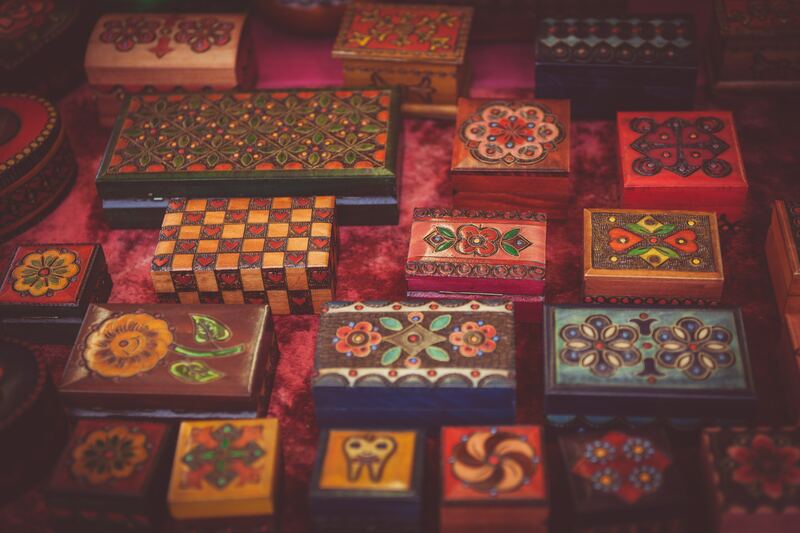 You can expect either a navy blue cardboard box or a cherry wooden box, depending on the type of jewellery. Take a closer look at this ring and GEM STONE KINGS extensive collection, you’ll love their jewellery. We think that this is a special aquamarine ring designed by PEORA that deserves to be shouted about! 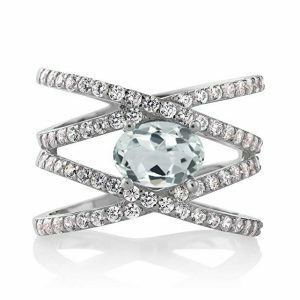 The stunning piece consists of an aquamarine stone in the centre of the ring surrounding by glistening diamonds embedded next to each other. These sparkling diamonds continue along the ring’s band creating a sea of sparkle which you won’t want to take your eyes off! When it comes to the aquamarine gemstone this is a natural stone that is an ice blue hue colour which contains a brilliant sparkle. The gem has been cut into a cushion cut shape and is approximately 6mm long by 6mm wide. The aquamarine has also been held in place by a prong setting. The ring itself has been made from a 14k white gold metal that has a glorious shine to it and is extremely strong. This is great because it not only looks pretty but is durable so will last for a long time. As mentioned the ring has also been decorated with sparkling diamonds that are in fact white topaz stones. We’d recommend giving this breathtaking ring as an engagement ring. The surprise and happiness on the ladies face when she sees this ring will be out of this world. The colour, diamonds and attention to detail put into this ring is really something else. Another benefit of this ring is that the jeweller offers a 30 day money back guarantee so if you or lady isn’t 100% satisfied with the ring. To give you an idea of the size of the entire ring, the rings face is approximately 3.8 inches by 3.8inches, making it a descent size and a true statement piece for your lady to wear on her finger. This lovely ring sold by PEORA is being sold for a high price but its well worth the dollars. This gem will arrive in a smart black jewellery box, keeping it safe and protected. There’s one thing to point out about this ring which is that the stone is actually higher than the image looks so you need to be careful not to catch your ring on any clothing because it could cause a tear. Other than this we think it’s a stunning ring which any lady would be lucky to have! 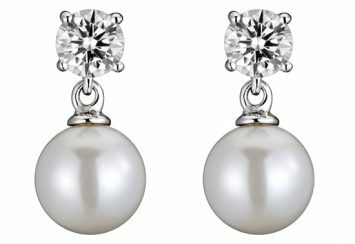 Take a look at the jewellers extensive collection, you may want to purchase a matching pair of earrings or a cute little pendant. If you’ve got a limited budget but still don’t want to compromise on quality and class then this ring is definitely something special. The focal point of this ring is a circular deep blue aquamarine stone which looks breathtakingly beautiful. This is positioned in the centre of the band on a raised nest with a smaller white circle style diamond either size of the gemstone. It’s important to note that even though this ring is a daintier style ring it has a slighter thicker band in comparison to some of our other rings which we’ve reviewed in this line-up of the best aquamarine rings. It features a sky blue aquamarine that has been cut into a round shape which is approximately 6mm long by 6mm wide. It’s important to point out that the stone featured is this ring is natural. It is also positioned securely in place by a 4 prong setting on the band. As previously mentioned this ring includes two smaller diamonds, one either side of the gemstone. They are both created sapphire diamonds which are white and have been cut into a round shape. Slightly smaller than the gemstone, these two stones are approximately 2.5mm long by 2.5mm wide. When it comes to the choice of metal this ring features a sterling silver metal which is very smooth, shiny and its composition is extremely strong. You’ll also notice that this ring has been designed with a classic but modern feel to it. 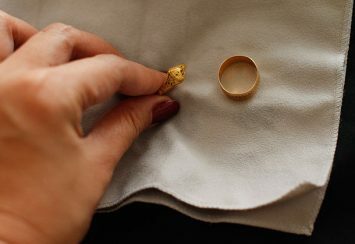 It also includes the timeless three ring concept (past, present and future) ring which is a very popular choice of ring. Another great quality of this ring is that if you’re not 100% satisfied with this ring you can return it. Want to find out more about the ring don’t wait another minute! This piece has been designed and made by GEM STONE KING and we think you’ll either love it or hate it. WARNING! The ring is very big and chunky so may not be everyone’s taste but never the less, you’ll get heads turning with this ring. We guarantee it! ItThis ring consists of a square shaped aquamarine stone in the centre. Two pear shaped diamonds are featured on this ring, one either side of the gemstone. Smaller diamonds are then placed throughout the ring creating a sea of diamonds. This ring is definitely a lot bigger and wider than any other diamond ring that you would have seen before. The ring’s band is also made from a sterling silver metal. The aquamarine stone is a sky blue colour and has been cut to an octagon shape with a length of approximately 10mm by a width of 8mm. This gem is 3.89 carats and has been positioned securely in a 4 prong setting. As mentioned, either side of this gemstone there are a pear shaped diamond. This is a white cubic zirconia diamond which looks utterly gorgeous alongside the gemstone. Smaller circular cubic zirconia stones have also been scattered across the entire ring. These are approximately 1mm in length by 1mm wide. There are around 67 stones in total. The entire ring is a big statement piece so if you love chunky jewellery you’ll love this piece. It is also being sold for a low price which makes it a great buy. One again this is another of GEM STONE KINGs stunning rings. 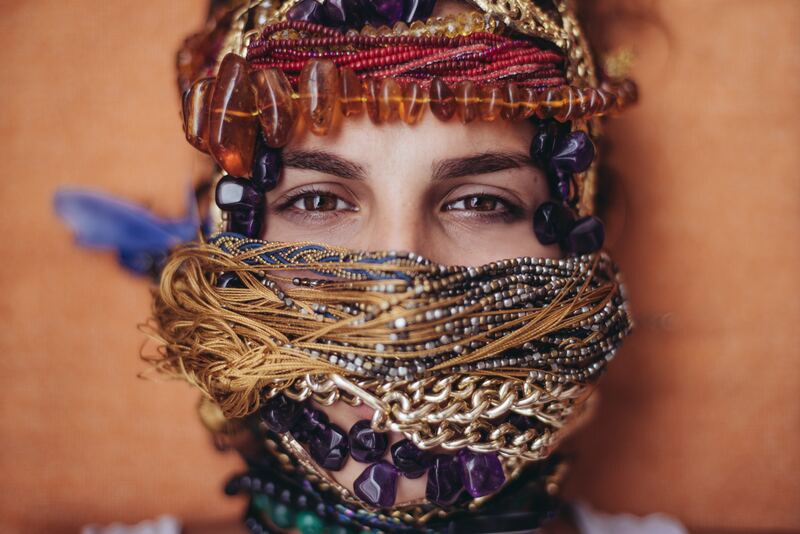 What we love about this jeweller is that they offer plenty of variety when it comes to designs. Large, dainty and elegant, whatever style you like they’ll make it! To complete our round-up of the best aquamarine rings we thought we’d choose this elegant ring that has a traditional vibe to it. 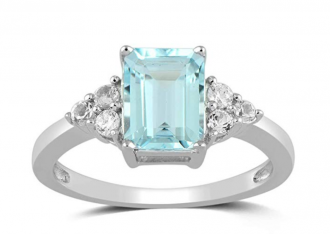 This ring has a rectangular shaped aquamarine stone as its main focal point. The traditional cut of this gemstone really draws your eyes to this piece of jewellery. The jeweller has also decided to add a touch of sparkle to the ring in the form of smaller circular diamonds. A cluster of these diamonds have been positioned either side of the centre gem which brightens up the ring and makes the gemstone stand out even more. The gemstone looks like it’s also been raised in height slightly so you won’t miss this piece of jewellery. The ring also features a slightly thicker band. We love how the band is smooth and very shiny so you won’t want to take it off. This gorgeous piece has been crafted using a strong sterling silver metal which complements the gemstone and diamonds perfectly. The sky blue coloured aquamarine stone has been cut into an octagon shape and is approximately 14mm long by 10mm wide. This large stone has been positioned securely via a prong setting. The smaller diamonds have been created from white cubic zirconia stones. These have been cut into a round shape and are approximately 2mm long by 2mm wide. In total the ring includes 11 diamonds across the ring. It has a modern but traditional feel to it which makes it a timeless piece of jewellery that will suit a day and night occasion. We think this would make a lovely birthday or anniversary gift for the special lady in your life. This piece is also being sold for a low price which makes it a fantastic buy! This stunning ring has been created by GEM STONE KING who makes quality rings. We love this ring and think it would make a fantastic addition to any ladies jewellery collection. Plus, it’s been made by one of the best jewellers around. 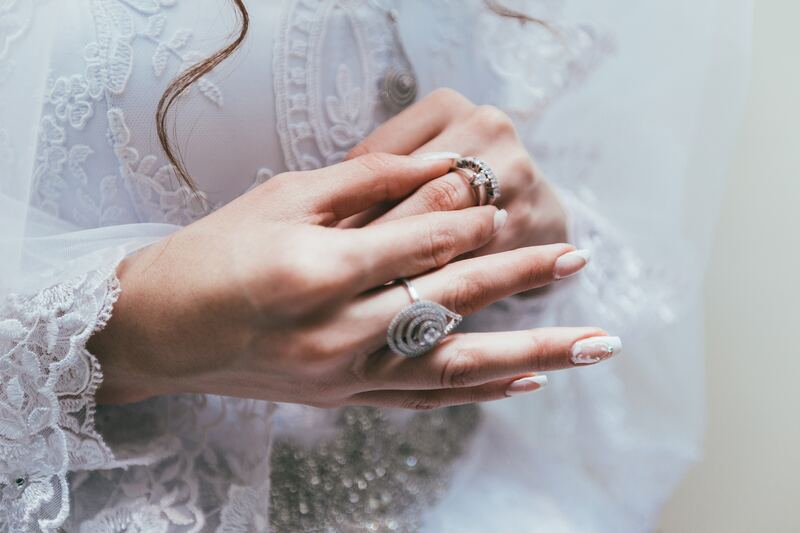 Your gorgeous ring will arrive in a cute little jewellery box so when it’s not being worn your ring can stay safely in the box. Go on have a look at their website, you know you want to!